You should be able to find the answers for the following questions without difficulty. For each question you should take about one minute at the most (if you have understood basic principles in this section thoroughly). A current flows in the circular loop because of the increasing magnetic flux linked with it. This increase in the magnetic flux is to be opposed in accordance with Lenz’s law. The magnetic field lines produced by the straight conductor are directed normally into the plane of the circular coil (away from the reader). Therefore, the direction of the magnetic field lines produced by the induced current in the circular coil must be directed normal to the plane of the circular coil and towards the reader. The induced current should therefore flow in the anticlockwise sense. The magnitude of the induced current is constant since the rate of increase of flux is constant. The correct option is (c). You will find many useful posts on electromagnetic induction on this site. You can access them by clicking on the label ‘electromagnetic induction’ below this post. 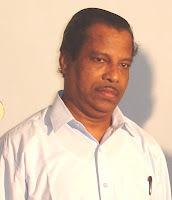 Application materials of the Joint Entrance Examination 2009 will be issued with effect from 19th November, 2008. On-line submission of Application will also commence on the same day. Application materials can be purchased from designated branches of Banks and all IITs between 19.11.2008 and 24.12.2008 by paying Rs. 500/- in case of SC/ST/PD/Female candidates, Rs.1000/- in case of male general/OBC candidates and US$ 100 in the case of candidates appearing in Dubai centre. The last date for postal request of application materials is 16-12-2008. The last date for receipt of the completed application at the IITs is 24th December, 2008. Online Submission of Application: This facility will be available between 19.11.2008 and 24.12.2008 between 8:00 hrs and 17:00 hrs. through the JEE websites of the different IITs. Visit one of these web sites (http://jee.iitm.ac.in) for more details. A 5 V battery with internal resistance 2 Ω and a 2 V battery with internal resistance 1 Ω are connected to a 10 Ω resistor as shown in the figure. 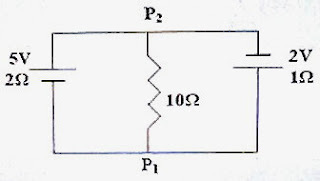 The circuit is redrawn, indicating the currents in the three branches. We have marked the directions of the currents I1 and I2 in the directions we normally expect the 5 V and the 2 V batteries to drive their currents. [Note that there can be situations in which the direction we mark is wrong. There is nothing to be worried about such situations since you will obtain a negative current as the answer and you will understand that the real direction is opposite to what you have marked in the circuit]. These equations can be easily solved to give I1 = 2.34 A (nearly) and I2 = 2.31 A (nearly) so that the current (I1 – I2) = 0.03 A. 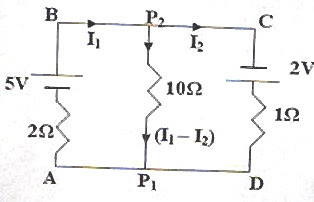 Since the currents I1 and I2 are obtained as positive, the directions we marked are correct and the current flowing in the 10 Ω resistor is 0.03 A, flowing from P2 to P1 [Option (4)]. [Suppose we had marked the current I2 as flowing in the opposite direction. The current flowing in the 10 Ω resistor will then be (I1 + I2). We will then obtain I1 = 2.34 A and I2 = – 2.31 A, the negative sign indicating that the real direction of I2 is opposite to what we marked. The current flowing through the 10 Ω resistor will again be obtained correctly as (I1 + I2) = 2.34 A– 2.31 A = 0.03 A].